Bif Bang Pow! 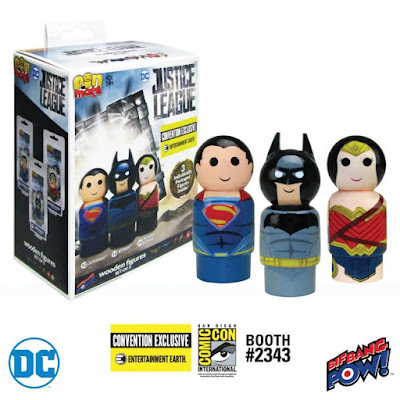 and Entertainment Earth are set to greatly expand their popular line of Pin Mate 3” retro styled wooden figures with five awesome, officially licensed San Diego Comic-Con 2017 exclusive Marvel and DC Comics sets! Each super hero and villain Pin Mate features highly detailed, brightly colored 360-degree artwork, and three of the five sets even include character specific vehicles, which the Pin Mates can fit into! All of the San Diego Comic-Con 2017 Exclusive Marvel and DC Comics Pin Mate Sets seen here can be purchased at the Entertainment Earth SDCC booth #2343 or pre-ordered online now at EntertainmentEarth.com. 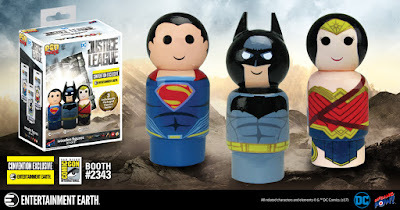 A fantastic find for Justice League Movie fans, this Justice League Pin Mate Wooden Figure Set includes Superman, Batman and Wonder Woman Pin Mate figures inspired by the 2017 live action film, Justice League! Each set features a holographic sticker printed with the production number. 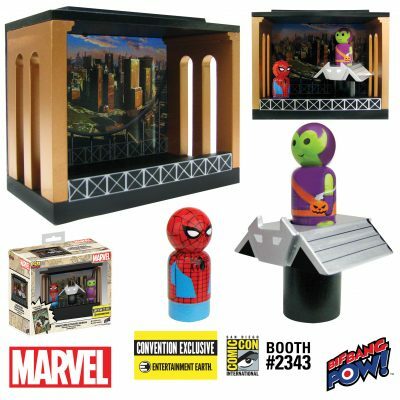 Spider-Man and Green Goblin face off in this sensational Spider-Man Pin Mate Wood Glider Set! The epic battle takes place inside a wooden New York City diorama, complete with the Goblin Glider vehicle. 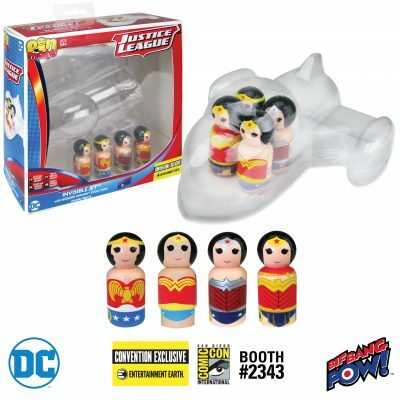 Trace the evolution of DC Comics’ Amazon Princess through this unique Pin Mate set featuring Golden Age Wonder Woman, Silver Age Wonder Woman, New 52 Wonder Woman and Rebirth Wonder Women – plus her iconic Invisible Jet! But what’s really cool is all four figures fit inside the plane. Capture the action and excitement from the Marvel movie Guardians of the Galaxy Vol. 2 with this awesome Pin Mate, which includes Ego, Mantis, Nebula, Ayesha and Taserface. The Batmobile goes camo with this San Diego Comic-Con 2017 exclusive Camouflage Batmobile Pin Mate Wooden Figure Set that includes Batman and Bane! This set is based on the popular 2012 DC Comics film, The Dark Knight Rises. 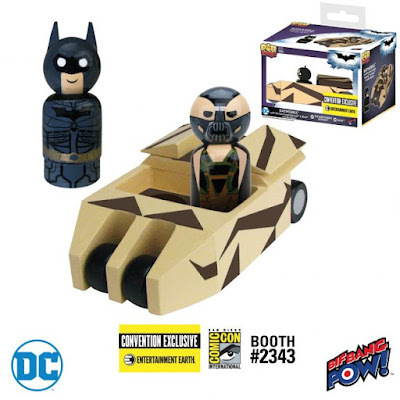 Along with the set’s exclusive camouflage detailing, this 2” scale wooden vehicle sports rolling wheels and seats two Bif Bang Pow! 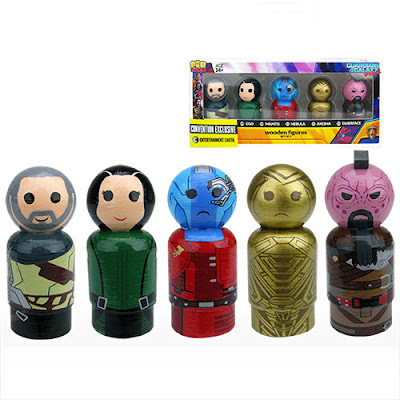 Pin Mate figures.